Kinner Kailash is one of holiest place in Himachal. This is the place named after Kailash, the home of Lord Shiva one of the five Kailashas on earth. The Kinner Kailash known globally as Kinnaur Kailash is situated in Kinnaur district of Himachal in front of Kalpa, district headquarter of Kinnaur. Kinner Kailash is popular for a very beautiful and adventurous trekking route. 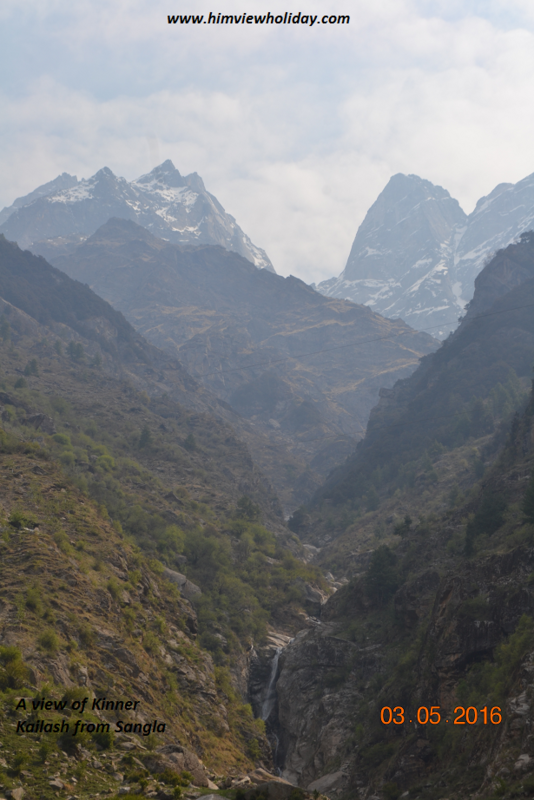 The trekking route goes through different locations. Some of them are from Sangla valley, from Powari and from Ribba village. The trekking route is for two days only. One day from Ribba to Kanda or the Cave whichever is best and the second day up to Kinner Kailash darshan. Then coming back to Kanda dogri of Ribba village. The adventurous route has many view-able and breath taking points on the way. Darshan Park, Ganesh Park and Parvati Kund are some midway places on the way to Kinner Kailash/Kinnaur Kailash. The Kinner Kailash tour package is one of the most popular tour package especially for religious tourists provided by us. Our Kinner Kailash tour package starts from Shimla or Chandigarh whichever suitable for visitors. Our Kinner Kailash tour package starts from Shimla onwards visiting through many religious and popular tourist destinations. In the morning after breakfast our cab will pick up and proceed to Sarahan. Sarahan is also a very famous religious tourist destination. On the way Kufri, Fagu,Theog,Matiana, Shilaru ,Narkanda and Rampur are major tourist destinations to Sarahan. Night stay at Hotel at Sarahan. In the morning after morning aarti at Bheemakali Temple at Sarahan proceed to Kalpa the next destination of our tour. Kalpa situated in front of Holy Kinner Kailash. A beautiful market of Recongpeo and a best view place of Kalpa will make you full of energy to start your trekking tour of Kinner Kailash. In the early morning after breakfast proceed to Ribba, abeautiful village especially known for Grapes and Apples. From Ribba now on foot walk or trekking starts. We assure your trekking with a local tourist guide who will help you to reach easily for your destination. Night stay in cottage or dogari at Ribba Kanda. In the morning after breakfast or fasting if anyone can proceed to Darshan. On the way Darshan park and Ganesh Park are situated from where you can visualize the scenic beauty of Kinnaur. Also have police assistance and medical help here. Now proceed upwards see Parvati Kund and have puja here. 4 hours long trekking finally you will reach at the Large Shivlinga of Kinner Kailash. The Shivlingam is situated on the top of the hill. After darshan and puja come back to Ganesh park where Bhandara may be organised by local yatra committee. Night stay at Cottage. In the morning after breakfast finish your trekking at Ribba. Now by cab proceed to Shimla. In the evening after having glorious memories of Kinner Kailash in mind check in at hotel at SHimla.